We’re doing a small batch of Xbox 360 laptops for Holiday Season 2012. This was the unit we built on Episode 52 of the Ben Heck Show. For a lot more photos and information click here. If you’re interested in buying one please email me. To pre-answer 2 of the most common questions: Yes, it works on Xbox Live and No, I don’t take systems in trade. Taking out the HDD was not a good idea, there are some games that people play like Halo: Reach that restrict you from using specific gametypes to play the game. And even saving gameplay videos. Also does it have a headphone jack? How much would you be looking for one of these ??? I like it a lot and Daddy got cash but…..
the layered plastic doesn’t look good and isn’t flush with the disk drive flap. Why is everyone having such a problem with the lack of an HDD? Sure Halo 4 requires an 8GB install but just grab a 16GB USB. You can get those small ones that look like a wireless mouse receiver and you’ll never notice it. I’ve read that with the recent update you can start using 32GB sticks (I havent heard if you can use two for a total of 64 or not). It’s interesting. All these complaints. Me and my friend are starting to make these ourseleves, they are going to be 250GB HDD with audio jack and any other complaints people might (also it’s going to be $1500). would it be possible to get just the plastic metal case around it? and if so how much would that be? I was just wondering if this device needs to be plugged into an outlet to work. Very very beatifull. I would like to buy it, but i can’t for now. 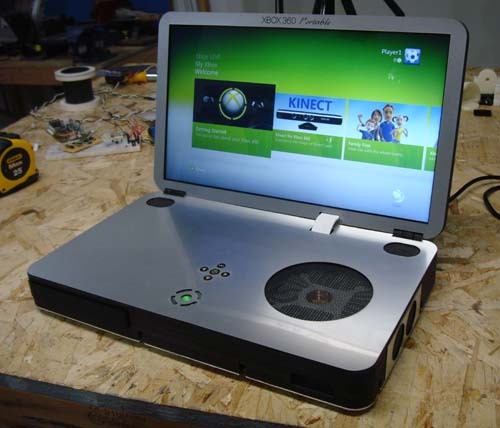 Hey Ben, I have been looking at ways to make my own xbox laptop and all of the ones I see have to plugged in to power on, I was wondering if you could make one with a battery inside. Would it be possible to do that?